Great review, as always, Dan. What a cool knife. I really like the modified reverse tanto blade, really sweet. I’d consider getting this knife however where I’m at I can’t carry a blade over 3.5″ so there’s no point really. Still really cool knife. Anyways I have a quick question if you don’t mind. 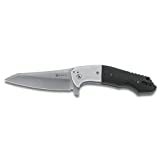 I’ve really been eyeing the Benchmade 940, it’s been calling out to me(so to speak). Your review really sold me on it and I’ve been considering getting it ever since. Well when finances permit that is. Have your thoughts changed at all on the BM 940? Does it still hold up in your opinion? Please let me know. Thanks Dan! Thanks again for the kind words Sam, and don’t hesitate to ask if you have any other Qs. Great review. There’s no question that the blade is the star of the show with that incredible reverse tanto shape and those grinds. It can’t explain it, but the blade shape looks like it is in motion when it’s just a static picture. This knife looks like something that Kershaw would come out with (and I kind of wish that they had). I am really considering this one since the Shenanigan has impressed me so much. Take Care! Thanks for dropping in man, very cool to see you here! 🙂 I know, I am absolutely in love with the blade on this one too… they did such a nice job with it. It’s a nice knife overall, easily on par with the Kershaw’s I have handled in terms of build quality. Worth considering imo, but of course the ultimate decision is up to you. As you know, I couldn’t agree more with all your points here. The Eraser certainly is an excellent knife. Thanks for stopping by man yeah – and yes, this knife rules! I received the Eraser a few days ago. I agree that the knife is beautiful and very smooth to open. My knife has very evident tooling marks on the bolsters and on the flipper. There was also some front-to-back blade play after opening the knife a few times. Anyone else notice either of these issues? Judas I would recommend contacting CRKT customer service, tooling marks and front to back bladeplay are not how the knife should be! My pleasure Yaron! The Ripple is a very nice knife – what a great introduction to collecting. Super review. I really like Eraser. My black partially serrated one is my companion to go jogging in woodland near my house. The weight and flipper makes it easy to deploy. I too wish the blade steel can be a bit harder than AUS-8, but as you mentioned, can’t complain about the price of whole package. Very well thought after design by Mr. Mah. Thanks for stopping by and leaving the superb comment. Glad you like your Eraser as well. Yeah, Aus8 could always be improved upon, but it looks nice and is easy to maintain.